LOG Guide Trips run $650/day for 1-2 anglers. Holter Lake (and The Land of the Giants) – Kind of two lakes in one – Upper Holter and Lower Holter -connected together by the area known as the “Gates of The Mountains.” Named so by the Corps of Discovery (Lewis & Clark) when they traveled through this massive, meandering canyon and it appeared as though the canyon walls were opening and closing as they wound their way up river like gigantic gates. There is a wonderful, interpretive boat tour through this section of the river that is a perfect side trip to do when you are visiting the Missouri for a few days. 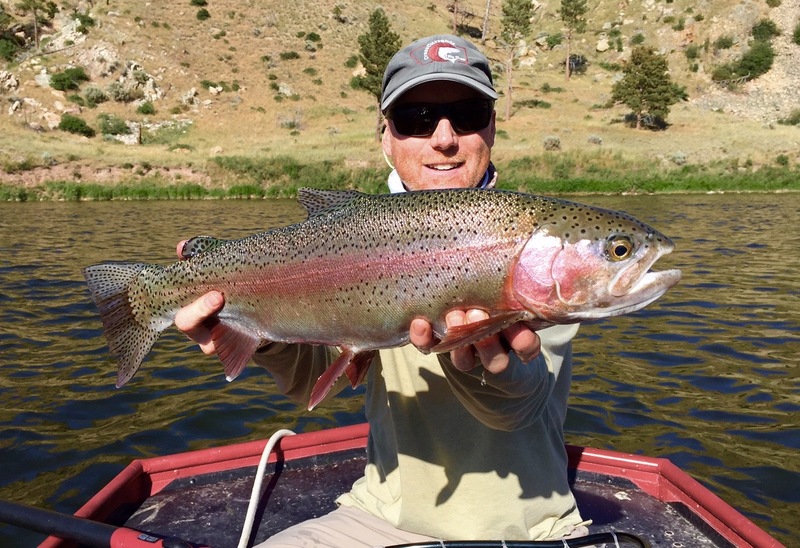 Lower Holter can be good fly fishing but mainly in the Spring from shore or a float tube or kick boat, as the rainbows are cruising the shoreline (similar to Canyon Ferry -see below) and before the boat traffic gets going for the season. Unlike Canyon Ferry, the water level in Holter Lake does not fluctuate very much because of how they manage Hauser and Holter Dams. They are “run of river” dams – so whatever they let out of Canyon Ferry, is what they let out of Hauser and Holter. Upper Holter Lake is also the launch location for the area of the Missouri River now known as “The Land of the Giants” (LOG). Why? Because the trout, both rainbows and browns, live most of the year in the larger, fertile reservoir, eating voraciously, getting fat and strong and then run up to the shallower, river section above Upper Holter up to Hauser Dam where you’ve got a shot at catching trout in the 20” to 30” range on flies! We have a couple of our Outfitters who are also Coast Guard approved Captains that are licensed to run jet boat Guide trips to this unique fishery.